Seasons Greetings from the cold north! It’s been a bit of a chilly week here in Edmonton. Temperatures are usually around -4 to -6 for this time of year, but this week we’ve had the delights of -19 and at one point, -24. Now I know it’s going to get a lot colder as we move into the New Year, but still – boy, is it a bit brisk. On the last day of school, it was pyjama day so all 3 kids trampled off to school with their PJ’s on underneath ski pants, boots, thermal coats, hats, gloves and scarves. It was so cold that they didn’t even get ‘recess’ – which given the scant nature of their PJ’s, I was somewhat relieved. That said, there’s no doubt about it – every year it’s a white christmas here, and it certainly feels it with the snow, the ice, the cold, and the numerous christmas decorations. Now talking of which …..
Once we pass Halloween, it seems to be a ‘free for all’ on the Christmas decorations front. With the dark early nights, cold temperatures, and snow all around, the colour from the displays definitely brightens things up as you drive through the City and residential streets. 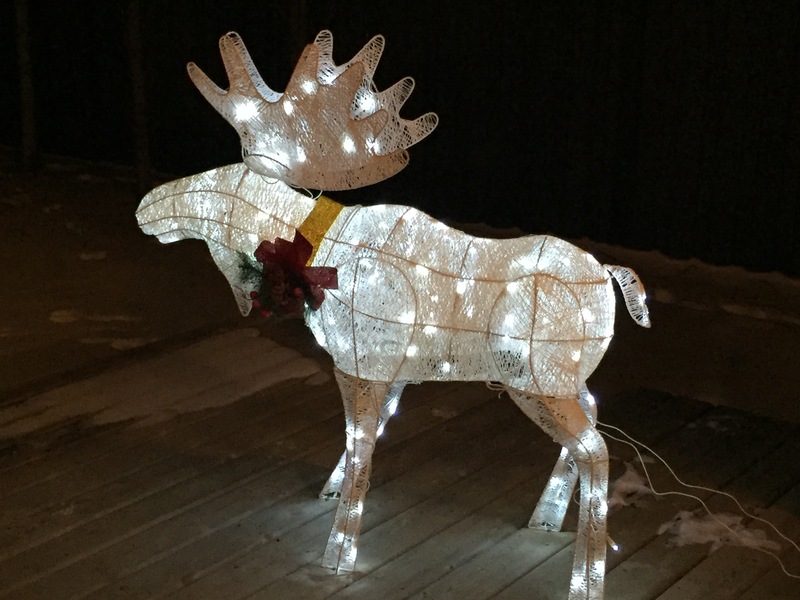 We’ve even joined in, and have added to our range of Christmas cheer this year in the form of a moose. No, not a real one, but standing on our decking about the size of a Shetland Pony, beaming out white Christmas lights. 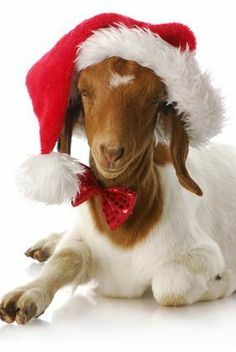 Ho, ho, ho ….. Ever wondered about the definition of a ‘white’ christmas? Well, I know in England it’s determined by the UK Met Office who only require one snowflake to be observed falling in the 24 hours of Christmas Day somewhere in the UK – whether or not a single snowflake melts before it hits the ground. I remember every year just wishing for a ‘White’ Christmas to be declared – but they’ve been few and far between and seemingly unlikely this year too. It’s a different story here in Edmonton. A ‘white’ christmas is one where there is at least 2cm of snow on the ground at 7am on Christmas morning. This year (and I assume each and every year), we’re safe on that score. Now, this doesn’t invoke a sense of expectation or excitement when the prospect of snow is somewhat a ‘given’, so there’s an additional element built on top as to what constitutes a ‘perfect’ Christmas? Any ideas? Well, the formal definition is that along with the criteria being satisfied to declare a ‘white’ christmas, snow needs to be falling at the same time ….. a-ha! 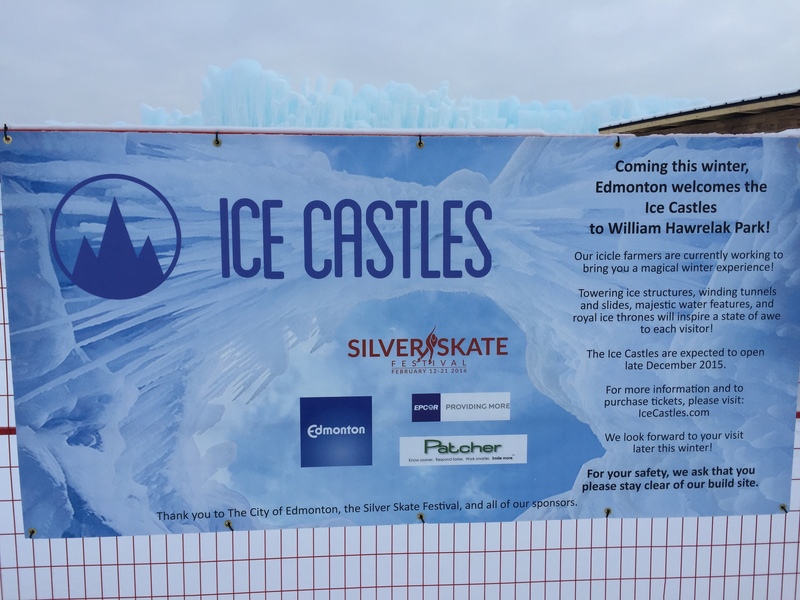 Let’s see if we’re in luck this year then …..
Now, on the topic of frozen ice….. Edmonton is home to a huge Ice Castle currently under construction in Hawrelak Park, a beautiful location down in the River Valley. 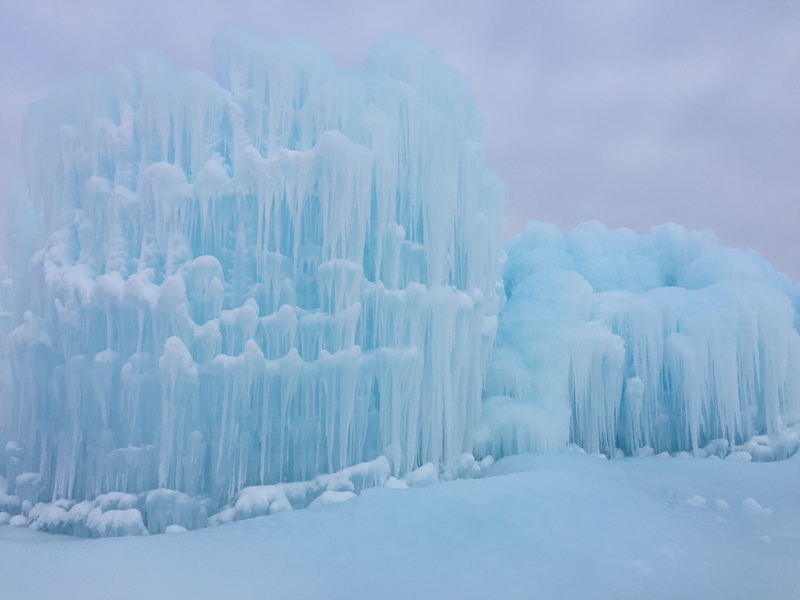 Billed as the largest ice structure in North America, once completed, it’s going to be open to the public and along with the castle itself, will also include slides, waterfalls, tunnels and caves which you can explore. Every metre of the castle is made up of at least 400 icicles which have been grown from over 3km of water sprinklers. We’re booked to explore it in early February so the kids are extremely excited about going inside. 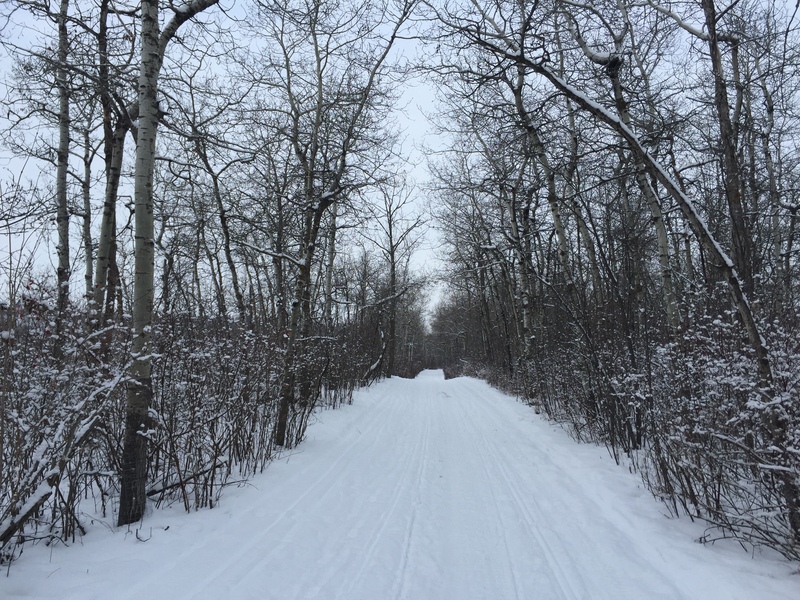 Here’s a pic amidst ongoing construction as we walked past earlier today …..
Edmonton isn’t called the ‘winter city’ for nothing. Along with opportunities for ice and snow sports during the day, there are lots of shows to go and see in the winter evenings. We’ve been on numerous excursions this week, ranging from the ‘Singing Christmas Tree’ show (brilliantly light entertainment and it was, literally, a choir nestled amongst lights and tiers resembling a Christmas tree), the “Festival of Lights’ at the local zoo (only the snow leopard and reindeers were out and about that night), the theatre play – ‘A Christmas Carol’ by Charles Dickens and excellently performed by a professional cast in a beautiful theatre, followed by the British panto, ‘Jack and the Beanstalk’ at Fort Edmonton which was in 1920’s style. Quite a cultural and eclectic mix of events and activities over the past few weeks – but great fun and well worth seeking out and visiting. The challenge will be maintaining the momentum and managing expectations for Christmas in Edmonton next year!! ← Active? Me? Well, what do you know …..
Wow. 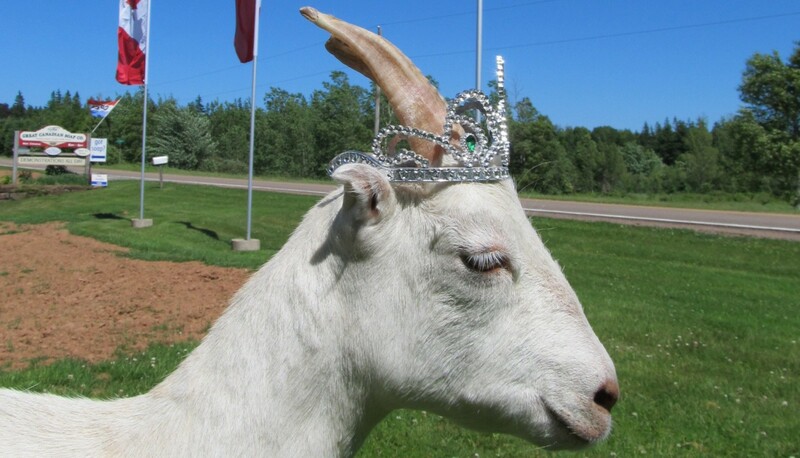 Can’t believe I missed this post. Am glad you pointed it out in today’s! I LOVE THAT MOOSE! I am so jealous! 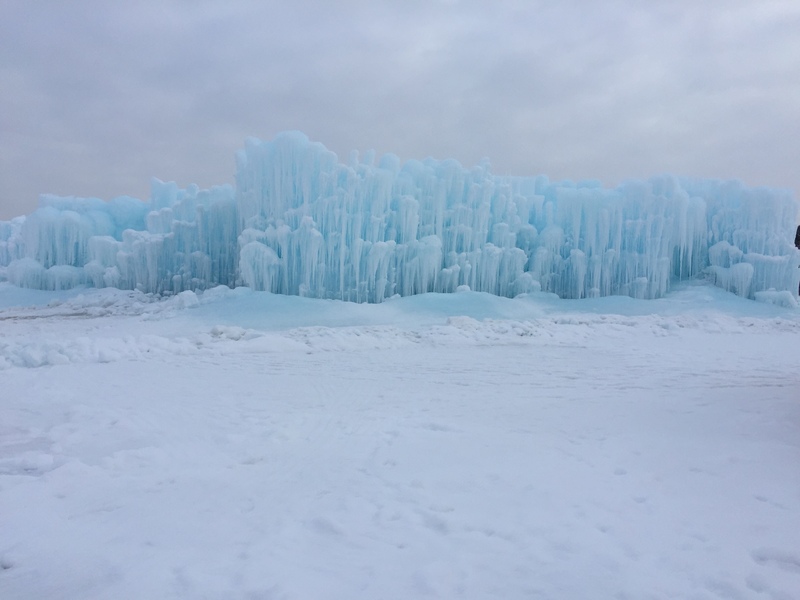 And that ice castle? I wanna come too! You better get some great pix in February and put them all right here!